Panda cams on again @ National Zoo!! When you click on, screen is black for awhile before view comes in. Have seen all 3. I think Bei Bei on cam1, Mei cam2, Tian Tian cam1 @ "howdy doody" door occasionally. But can't be sure, just glad I got to see all three!! Thanks for the update, SWINWK! On March 15, Mei Xiang started exhibiting behavioral signs that breeding season is approaching! A urinary hormone analysis confirmed that her change in behavior was due to her rising estrogen levels, signaling that the panda breeding season will be here soon. 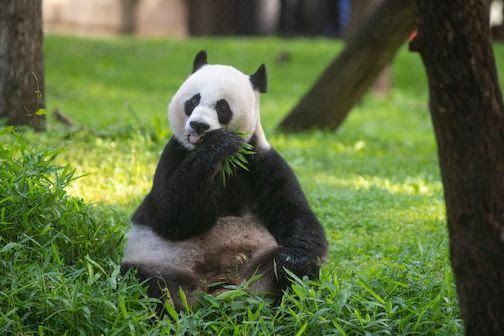 Mei Xiang’s behavioral changes have not been especially subtle, she has broken from her energy-efficient routine of eating and sleeping and is instead much more active. She is very eager to play and splash in the pools in her yard and enclosure, and the bubble bath tubs she receives as extra enrichment. She also has been scent-marking around her habitat. Scent-marks are one of the ways giant pandas communicate if they are ready to breed. Adults do not spend time together outside of the breeding season. A scent-mark helps the solitary animals find each other during the 24-to-72-hour window the female is able to conceive a cub. Mei Xiang is not just advertising her rising hormonal levels through her restlessness and scent-marks, she is also vocalizing. She began bleating at keepers, which is something she only does during the breeding season. Tian Tian has been following all of these changes vigilantly. Over the weekend, he started bleating at Mei Xiang, one of his ways to communicate that he is interested in her. He also has been spending a lot of time at the howdy window that separates their yards. This week he has been bleating more frequently and has tried to keep Mei Xiang within his sight. Although Tian Tian is very interested in Mei Xiang, she has made it clear with her vocalizations that she is not ready to breed. Keepers are going to continue to monitor the pandas for behavioral changes. Meanwhile, endocrinologists at the Smithsonian Conservation Biology Institute will continue monitoring her hormones to determine when Mei Xiang reaches peak estrus." Thanks from me too Gigi!